Embark on an unforgettable voyage and experience in a few days what many only dream of. Immerse in Geraldton’s maritime history. Be spellbound by the sunset over the world-famous Cable Beach on an overnight stay in Broome. Venture to secluded Kuri Bay and explore of the regions iconic pearl farms amidst rugged, breathtaking surrounds. 1 night stay in Perth at the Rendezvous Hotel Perth Central including breakfast. 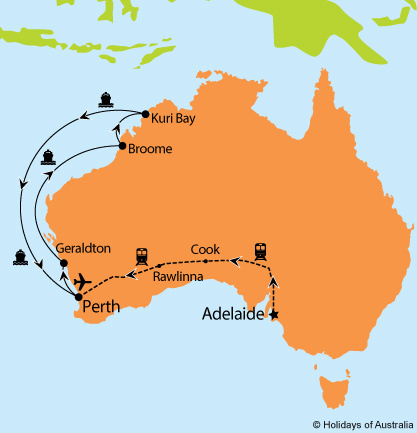 10 nights aboard Vasco da Gama cruising on a roundtrip from Fremantle with port calls in Geraldton, Broome & Kuri Bay. Your cruise includes on board meals & entertainment. 3 night stay in Perth at the Rendezvous Hotel Perth Central including breakfast. Half day Perth & Fremantle City Explorer with Swan River Cruise. Full day Margaret River, Busselton Jetty & Cape Leeuwin Lighthouse tour including lunch. Images courtesy of Cruise & Maritime Voyages, GSR, Tourism WA, Luke Austin Photography, Shutterstock.